Jerusalem district police investigators arrested five suspects who work in a burial arrangements company on suspicion of damaging and moving children’s graves from the 1970s to create and trade new burial plots. Two suspects of the religious council were arrested in a city near Jerusalem on suspicion of trafficking and wholesale sale of illegal burial plots. Police investigations in the police fraud department began an investigation following complaints and reports, in which there was a suspicion that the graves in Givat Shaul, Jerusalem, were suspected of being damaged and moved. This led to suspicions of wholesale trade in burial plots in Beit Shemesh for foreign residents. In the course of the police investigation conducted in the Fraud Unit, the investigators collected evidence against 5 suspects, including senior company officials and contractors. 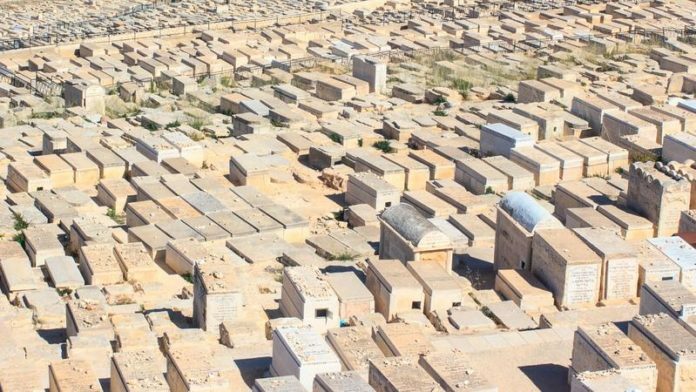 In addition, the investigators conducted a variety of investigations into the Givat Shaul cemetery in Jerusalem, Har Menuchos, as over the past year, aerial mapping shows changes to the “New Daled Section”, which is children’s graves from the 1970s. The investigation also revealed that the suspects removed the gravestones from their place, and through the contractors worked to raise the level of the ground, by pouring concrete for the purpose of creating new burial plots (over 9 existing graves), which were allegedly sold for NIS 100,000 each, to foreign residents. The five suspects were brought for questioning by the police on suspicion of fraud under aggravated circumstances, violations of the Jewish Religious Services Law and trespassing in place of worship or burial. During the police investigation conducted in the fraud department, the investigators collected evidence against two senior suspects, during which it was suspected that in 2018, dozens of burial plots were being sold to foreign residents at an estimated value of NIS 1 million, in violation of the Jewish religious services law. The police investigation also raised the suspicion that the suspects intended to carry out another deal involving dozens for additional burial plots for foreign residents for similar sums. Four of the suspects were arraigned on Sunday afternoon in the Jerusalem Magistrate’s Court. A shame!…..but good to know. Thank you. How low can these rashoyim stoop? More than 6′ I suspect.